Stackwell Forge are traditional blacksmiths and manufacturers of high quality ironworks. Specialising in reproduction Victorian ironworks including entrance gates (manual or automatic), railings, balustrades, handrails and stairways. We undertake reproduction, restoration and modern ironworks and we are able to forge, cast or fabricate in any material for commercial or domestic use. Located near Peterborough, Cambridgeshire, we are able to supply our services to many locations thoughout the UK and further afield. Founded in 1990, Stackwell Forge has been involved with many prestigious projects. Since being awarded the title of "Small Business of the Year" by the Federation of Small Businesses in 1994, Stackwell Forge continues to go from strength to strength. To back up what we can manufacture here at Stackwell Forge, our team can survey and design for most styles, tastes and moods. 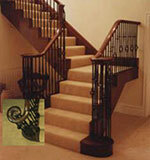 We also hold a good library of traditional ironwork patterns for anyone wishing to reproduce a particular period. We have many varied clients including National and Local Authorities. Renowned historic Universities and College's, United Nation,. Architects and interior designers.